A lot has happened to the Canadian indie folk collective The Fugitives since they were founded eleven years ago in 2007, and began what has been a roller coaster musical adventure. They’ve been nominated for several Canadian Folk Music Awards and a Western Canadian Music Award, headlined many top Americana festivals, toured Britain, Western Europe and constantly toured their native Canada where they’re one of the leading lights of the music scene. Still, The Fugitives have found time to release four albums, including The Promise Of Strangers which was recently released by Borealis Records. This is just the latest chapter in The Fugitives story. The Fugitives roots can be traced to the day when songwriter Brendan McLeod joined forces with three of his poet friends who just happened to play an instrument. Initially, Brendan McLeod remembers how: “we pretended to be a band” and “the music side was secondary.” However, after a while things started to change. Especially when Adrian Glynn joined the nascent band, and Brendan McLeod discovered that he had much in common with the newcomer. Both were from a performance, theatre and acting background, which meant they were able to see things from a different perspective. This proved useful when they began writing songs together. Straight away, Adrian Glynn and Brendan McLeod seemed to click as songwriters, and this was the start of a successful and fruitful partnership. That was no surprise to Adrian Glynn as: “we have similar ideas and politics.” The only problem was that Brendan McLeod was living in Vancouver and Adrian Glynn called Toronto home. Despite the distance between the two songwriters they collaborated on songs and soon, decided to road test them by playing live. The Fugitives having clicked as songwriters and musicians decided to released Face Of Impurity in 2007 which spent a month in the Canadian folk charts. This was the start of The Fugitives’ recording career. Later in 2007, The Fugitives returned with their debut album In Streetlight Communion which the band released. In Streetlight Communion was a showcase for the songwriting and musical skills of Adrian Glynn and Brendan McLeod as The Fugitives won over music fans with their unique indie folk sound. Already people were taking notice of The Fugitives whose career was well underway. Over the next couple of years, The Fugitives continued to tour their native Canada, and spent much of their time in cars and vans travelling between venues. The rest of the time Adrian Glynn and Brendan McLeod spent on the other arts projects that they were involved with. However, in 2009, The Fugitives returned with their Find Me EP, which whetted music fans appetite for the band’s sophomore album. A year later, The Fugitives returned in 2010 with their eagerly awaited sophomore album Eccentrically We Love. Although this was The Fugitives’s first album in three years, Eccentrically We Love showed a band that was maturing with every release. While the music was ostensibly indie folk, other genres including folk hop and slam folk could also be heard on Eccentrically We Love, which marked the return of The Fugitives. It was another three years, before The Fugitives returned with a new album, and between 2010 and 2013 they continued what was a gruelling touring schedule. They were no familiar faces on the Canadian live scene and had already started to spread their wings, as they began to play further afield. However, in 2013 The Fugitives released their Bigger than Luck EP and their third album Everything Will Happen, which was hailed as the finest album of their career. Everything Will Happen spent ten weeks in the top ten of the Canadian folk charts, and was The Fugitives’ most successful album. After the success of Everything Will Happen, The Fugitives were invited to support Buffy Sainte-Marie during her tour of Western Canada and to appear at the prestigious Glastonbury Festival, in England. The Fugitives’ star was definitely in the ascendancy. Over the next four years, The Fugitives have continued to tour extensively playing at the major Canadian folk festivals, playing headlining slots in Americana festivals in different parts of the world and touring Britain and Western Europe. During this period, The Fugitives have continued to be nominated for a variety of prestigious awards in their native Canada. So far, this included several Canadian Folk Music Awards and a Western Canadian Music Award. This is no surprise to anyone whose been to The Fugitives show or heard their albums as The Fugitives are without doubt, one of Canada’s top musical efforts. Now after nearly five years away, The Fugitives recently returned with their much-anticipated fourth album The Promise Of Strangers. It features eleven new songs, including ten from the Adrian Glynn and Brendan McLeod songwriting partnership. They also wrote Till It Feels Like Home with drummer and percussionist John Ramsay, whose one of the guest artists who joined The Fugitives when The Promise Of Strangers was recorded. When The Fugitives began recording The Promise Of Strangers, the core band still featured Adrian Glynn and Brendan McLeod. This talented duo was able to play many of the instruments on the album themselves. Especially Adrian Glynn who is a multi-instrumentalist who played bass, guitars, mandolin, organ, piano, percussion, synths and added vocals. Brendan McLeod played guitars and added vocals on The Promise Of Strangers. However, The Fugitives still needed the help of some of their musical friends. As a result, Adrian Glynn and Brendan McLeod only brought musicians onboard as and when they needed them. This has served The Fugitives well on previous albums, and worked well during the recording of The Promise Of Strangers. The Fugitives drafted in a rhythm section that variously included drummer and percussionist John Ramsay, drummer Leon Power and bassists James Scholl and Marcus Ambramzik. Meanwhile, Steve Charles switched between banjo and bass and also added vocals, while Cory Sweet played baritone and tenor saxophone. Other musicians who made their way to the studio to augment The Fugitives were organist Ben Elliot, Cayne MacKenzie on synths, trumpeter Vince Mai, violinists Carly Frey and Ali Romanov who also added vocals. When it came to record No Words The Awesome Gospel Choir joined The Fugitives, and then The Awesome Friends Gang featured Come Back Down and the album closer Lights Out. When The Promise Of Strangers was completed, it was scheduled for release in early 2018 and marks the welcome return of the musical yin and yang Adrian Glynn and Brendan McLeod. They showcase their considerable skills on The Promise Of Strangers which is the fourth album they’ve recorded as The Fugitives. Just like previous albums and their live shows, The Promise Of Strangers combine complex harmonies with top class musicianship on cerebral songs that are full of social comment. Other songs are incredibly poignant and personal to The Fugitives. This includes songs that are dedicated to friends and family of the band. However, other songs are purely figments of The Fugitives’ fertile imagination. All of these songs are based around arrangements that are built around an acoustic guitar, piano, banjo, and violin, which is similar to previous albums. However, Promise Of Strangers is the most ambitious album from Adrian Glynn and Brendan McLeod and features some of the finest songs they’ve written during a career that spans four album and eleven years. Opening The Promise Of Strangers is No Words, a beautiful, poignant homage to Leonard Cohen written the day after his death. It features a heartfelt vocal and slow-burning arrangement on a song that sets the bar high for the rest of the album. The tempo rises on See This Winter Out which deals with a young friend The Fugitives who is undergoing cancer treatment. They’ve written a deeply moving and poignant country-tinged song that tugs at the heartstrings. Till It Feels Like Home is a piano led ballad that was written for the protagonist of the hit Canadian show Orphan Black. Again, the arrangement is a slow-burner which provides the backdrop to a soaring, soul-baring vocal. Another emotive vocals follows on Northern Lights where indie folk meets country as another carefully crafted arrangement takes shape. The Fugitives’ trademark harmonies opens the ballad For Everyone Else before a vocal bristling with emotion breathes life and meaning into the lyrics. It’s a similar case on My Mother Sang where the two members of The Fugitives pay an emotional and impassioned tribute to their mothers who both single-handedly brought up three children. The Fugitives indulge in some time travel on London In The Sixties, which features lyrics that are rich in imagery as they sing of the possible regrets of emigrating to start a new life overseas. As a result, the lyrics are delivered with power and passion as a rasping baritone saxophone solo soars above the arrangement adding the finishing touch to this thought-provoking song. On Orlando, which is dedicated to the victims and survivors of Pulse nightclub massacre in 2016, The Fugitives deploy synths and drums that have been treated with effects to provide a poignant backdrop to a vocal that is emotive and full of disbelief. From the harsh reality of real life, The Fugitives turn their attention to another fictional character in The Wind One. The Fugitives wrote this ballad for the adolescent lead in director in Randall Okita’s critically acclaimed debut feature film debut The Lockpicker. It gives way to Come Back Down where tubular bells join The Awesome Friends Gang’s backing vocals and play their part in the sound and success of this anthemic track. Closing The Promise Of Strangers is the rueful ballad Lights Out which The Fugitives dedicated to Adam Capay who has been held in solitary confinement in a Thunder Bay jail for four years with the lights on. It’s a thought-provoking way for The Fugitives to close their comeback album. 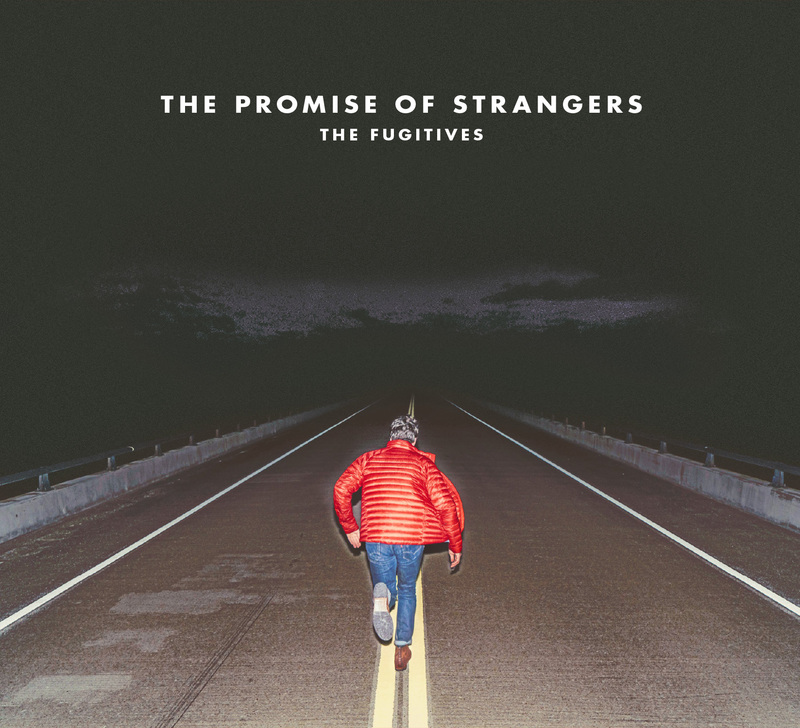 After nearly five years away, The Fugitives recently returned with their eagerly awaited and much-anticipated fourth album The Promise Of Strangers. It features uptempo songs, anthems and beautiful ballads on a carefully crafted album which features cerebral and thought-provoking lyrics. They were written by The Fugitives who have come of age on The Promise Of Strangers, which is the finest album of their eleven year career. So much so, that The Promise Of Strangers is best described as a career-defining album from The Fugitives, who reach new heights on and set the bar high for future albums. ← GENE PAGE-HOT CITY AND LOVELOCK.